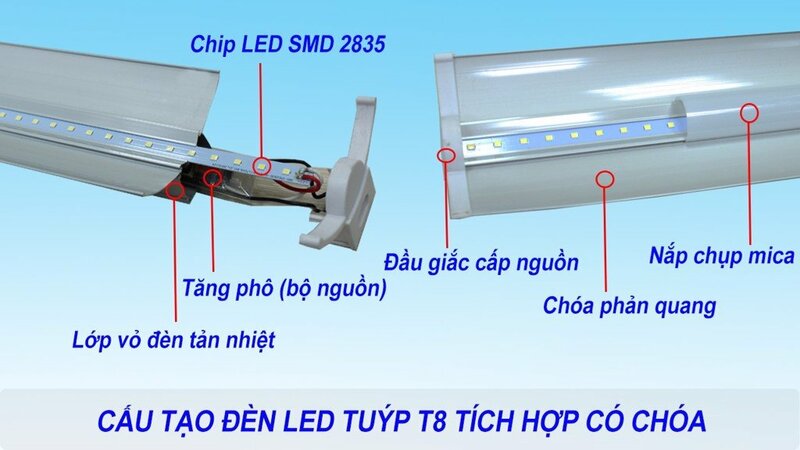 - LED Chip : Two LEDs use 2835 SMD LED chip, with LED chip number up to 48 chip (for 0.6m type) and 96 chip (for 1.2m type). 9W and 18W. - Power supply head : The headlamp is designed to connect at both ends, one end can be powered and one end can be connected to the other. Integrated T8 LED Tube Light is made into a solid, not a ball and a chute. Although the shape is no longer circular, the design of the lamp is similar to that of the T8 LED bulb. - The body is made of lightweight aluminum oxide, combined with a mica cap to form a neatly compact block. Incorporated into reflective lenses to improve lighting efficiency. - This lamp has a very special design and is very convenient for the user. When we need continuous lighting, we can connect the light bulbs together with a convenient serial jack. - The lighting industry has spent more than 120 years developing from incandescent bulbs to fluorescent bulbs of all kinds and then for the first simple display leds. In light of the growing trend of technology and towards being friendly and protecting the environment, the advent of LED lighting technology is indeed revolutionizing today's lighting technology. Capturing the latest technological trends in the lighting industry, AMBEE has launched the T8 LED Tube Light Series with 0.6m / 9W Diameter Type using high-performance SMD 2835 chips for superior performance. High brightness and longevity. - The first point to mention is the ability to save electricity, AMBEE type led lamp saves up to 60% compared to traditional fluorescent tubes. AMBEE type leds have a power output of only 9W while traditional T8 / T10 fluorescent lamps (18W or 20W). This is the most important benefit that many people care about, it helps households, factories ... save tens, hundreds of million per month. - The third benefit of the AMBEE type LEDs is that it's many times brighter than conventional lamps. The brightness of the lamps makes it possible for households, restaurants, companies, factories to reduce the number of lamps in the past. For example, in the past, my house had to attach two T10 lamps (20W / shade) to the guest room, now only two 9W LED lamps matched each other, only four lights, but the brightness was equal to 4 20W old lamp. If used in garment factories or leather shoes, the company can save a lot of electricity and also reduce the amount of light. LED integrated T8 tube with AMBEE cover suitable for use in dry areas, limited outdoor use or where high humidity. - Leather shoes and garment factory.